Ambulance crews responding to a 999 call that a 13-year-old girl was in cardiac arrest have been pelted with bricks and tables. Two air ambulance services have begun using the feature that allows medics to view casualties before arriving on scene. The world's oldest emergency service - the UK's 999 - has turned 80 years old. 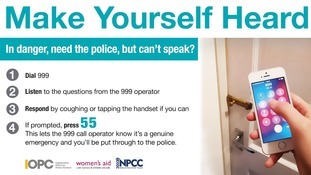 Surrey Police released audio of the call to highlight that the emergency number should only be used in real emergencies. Police were called after a seagull tried to steal a man's sandwich, it has been revealed. A recording of a woman calling 999 because she had maggots in her bin is among a number of time-wasting calls being made public.